There is an app for practically everything these days. When it comes to weight loss and fitness, there is no shortage available as well. These apps are designed to do everything from track calories, record workouts, count your steps and even provide workout ideas. With everything available it is hard to know what you need, what will be helpful or if these apps actually make a difference in our lives. In this blog, we will explore some commonly used apps and the research done on the reliability, effectiveness and negative connotations associated with them. This is by no means an all inclusive list and I do not recommend these over any other apps; these are merely apps I am familiar with and have used personally. There are so many versions that appeal to each individual’s personal preference and needs. I wanted to take a closer look at how fitness/workout apps played a role in our motivation, performance or overall outcome of our fitness goals. For counting calories, nutrients, macros, etc.. I have commonly used My Fitness Pal. I have found this app to be useful in keeping an eye on how many calories I am putting in my body. It offers the ability to scan bar codes and auto populate the nutritional values. Something to be aware of is if you are unable to scan the product, you can search for it. This is helpful since you can find many items have already been entered. You have to be careful though, because some people only enter partial data or incorrect information. Another flaw is, when you eat out, all the nutritional values may not be known, or variables, such as toppings, sides, etc may add to what you are recording. Pay close attention to serving sizes. I don’t believe these apps are extremely helpful if weight loss is your goal and you are not using any other program or if you do not have a specific plan to follow. What this does allow is for you to monitor your patterns, keep track of what you are eating and hold yourself accountable. Food journals have been long proved to curb some over indulgences and to find trends if associated with patterns in behavior and mood. When looking for something to track your runs or hikes, I personally use Under Armour’s, Map My Run app. This app lets you use GPS tracking to track your distance, speed and elevation gain. Problems with this feature is if there is no cellular data where you are, then there can be some lapses, however, I found this to be very rare. This app is great for tracking miles, speeds and consistency. When recently doing the ruck challenges, I pledged 25 miles for the month of March and was able to track my total distance easily. Another nice feature, is it gives you split times for each mile. Geoff and I were able to use this feature to try different styles of rucking and see the difference in pace for each mile. If you are running/walking solo the app connects to your music and will cut in with mile counts and times as you go. While the app itself may not make you get out there, the features it offers are helpful. As for apps related to CrossFit, the apps I have heard work well are Beyond the Whiteboard and My WOD. These apps allow you to log your WODS and track your results and progress. Beyond the Whiteboard also offers some instructional videos. Both have some WODs listed to include the hero WODs. These are best suited to log your workouts, record your max reps and even customize your own WOD and refer back to it for later use. Sometimes when we are working on our one or three rep maxes we waste a lot time building back up if we can’t remember where we last left off. Also, we may become discouraged, we are not able to see how much progress has been made. These apps allow you to keep tabs on exactly how far you have come and where to start when going forward. A study published in the Journal of Medical Internet Research says fitness apps absolutely do promote positive behavioral changes. The team surveyed 726 participants in three groups—current app users, non-app users, and former app users—and discovered that almost 75 percent of current app users reported being more active, as opposed to under half of non-users and former users. The researchers concluded that on any given day, exercise app users are more likely to exercise during their leisure time, as compared to those who don’t use any apps. Their research also found that these apps made it easier for users to overcome “barriers to exercise” (procrastination, lack of motivation, etc. 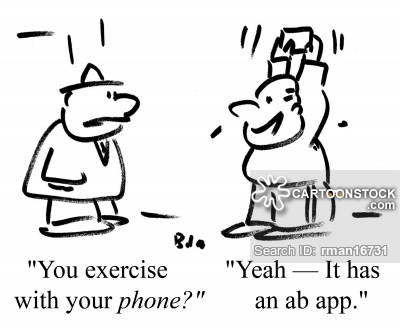 ), which is kind of the whole point of fitness apps to begin with. In an interview with Mic, associate professor of psychology at Lander College and one of the study’s authors, Leib Litman, says that they sought to prove that exercise apps could help make exercise more accessible to those who use them, and they succeeded. So what does all this mean? There is no overwhelming proof that any one app or using multiple will guarantee results. People who find health apps useful are generally those already working on their health. These should be viewed as tools to assist your progress and give assistance in achieving your goals. Happy tracking everyone!